I’m come to the conclusion that Studio Bergstrom is the single best source of inexpensive starship miniatures online. Most of their miniatures are clearly inspired by popular media but they have a wide range of diversity and – barring iconics like a Federation Starship or the Millennium Falcon – it’s not too hard to make most of their miniatures look generic. In any case, this time around I finished a swarm of Octilon Star-ships. I purchased these to add some diversity to starship combat in the Starfinder RPG. As for being budget friendly, at $1.25 for two the price is fantastic as compared to the official Starfinder starships, Firestorm Armada, or even Shapeways. 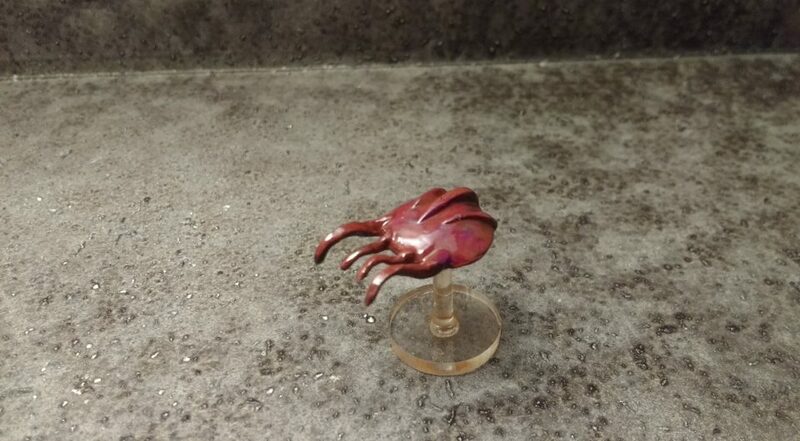 I primed the Octilon Star-ships with black gesso, then a dark red with purple splotches before giving it a glossy prime. 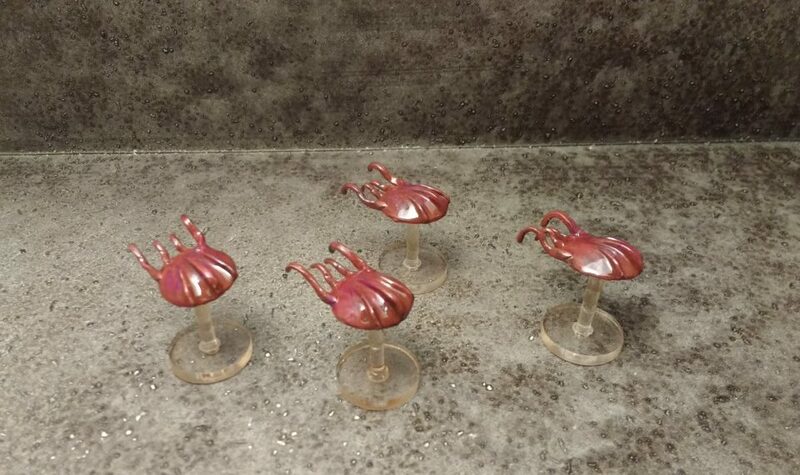 I didn’t follow up with a spray-on matte finish because I wanted to make these miniatures look alien. I liked how they turned out with the glossy finish. The flight base is one I ordered in bulk from Litko. The underside of the Octilon Star-ship is hollow, so I filled that it in with plastic putty which gave the flight base more stability. One thing to note – one of every two starships has the sculptor’s initials prominently carved on the top. Leaving the finish glossy helped hide this on mine but it’s something that someone with a keener eye for detail might want to to file off/fill in.